People living in apartments near future transit stations were most enthusiastic about voting for Sound Transit 3. 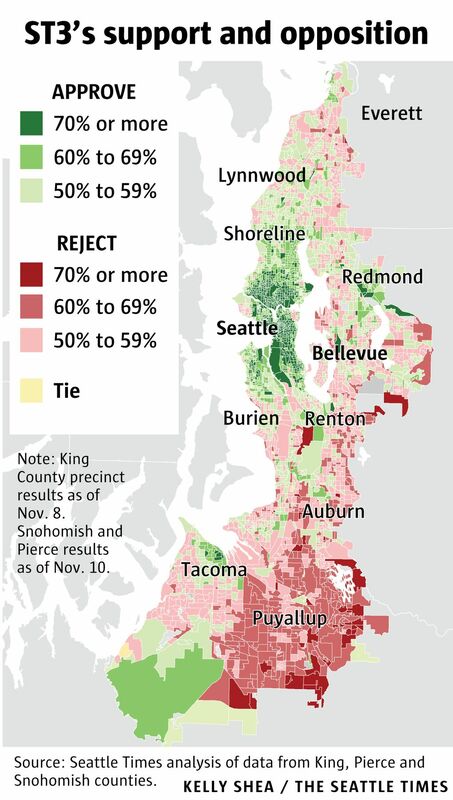 Check the map to see the vote, by precinct, in King, Snohomish and Pierce counties. The high-tech suburb of Redmond, where Sound Transit 3 promised light-rail service within eight years, delivered 60 percent support to the Proposition 1 ballot measure, according to precinct results released Friday. The $54 billion, 25-year plan won overall 54 percent approval in urban areas of King, Snohomish and Pierce counties, setting the stage for tax increases, starting Jan. 1. 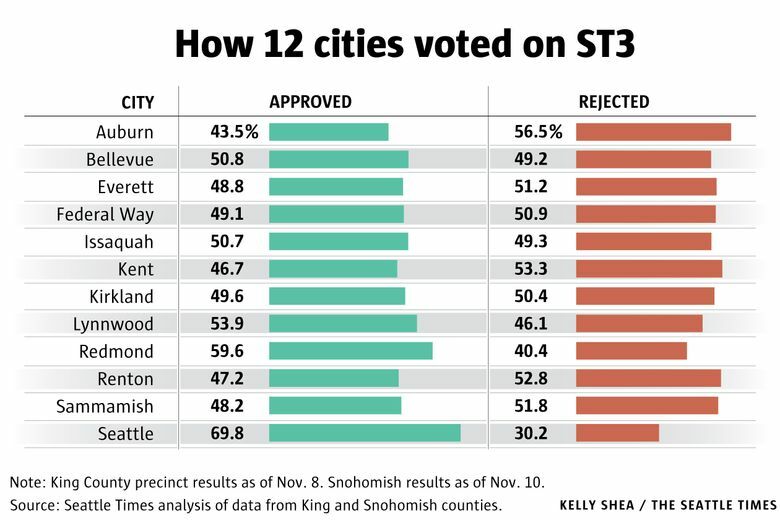 In general, people living near the planned bus and rail stations and neighborhoods dominated by apartments, gave ST3 its strongest support, according to the results from election night for King County, and through Thursday for Snohomish and Pierce counties. On the Eastside, ST3 will pay for an Overlake-Redmond extension, with stations in the quickly growing downtown and near Marymoor Park. Beyond the liberal strongholds in Seattle, the ST3 ballot measure did best in suburban precincts where apartments and condominiums sit next to future transit stations ­– especially downtown Redmond, and the Ash Way and Mariner station sites north of Lynnwood. Suburbs in Sammamish, Newcastle, and southern Renton, far off the future lines, were strongly opposed. A short distance east, most Sammamish voters filled the “rejected” bubble, unmoved by a planned 1,400-stall park-and-ride garage they can use near Marymoor, and a 200-car lot for the Sammamish plateau. The City Council opposed the measure. Newcastle, Renton, and Fairwood, far from the network, also opposed the plan, which will add a property tax with increases in sales and car-tab tax. In sprawling Federal Way, 49 percent voted in favor, and will get a train connection to SeaTac by 2024. Seattle delivered overwhelming 70 percent support, as did high-rise residents of downtown Bellevue. But approval throughout Bellevue was only 51 percent — compared with 57 percent for ST2 back in 2008, when a Bellevue line was on the ballot. Lake Forest Park and Kenmore favored ST3, which will improve their popular bus corridors along north Lake Washington. Pierce County’s pockets of support included Joint Base Lewis-McChord and nearby Lakewood, where Sounder commuter train stops at Tillicum and DuPont are promised near the base. Auburn, Puyallup and Sumner voters opposed the tax hike, despite their busy Sounder park-and-ride stations, and a ballot promise to increase train capacity and strive to add midday service.